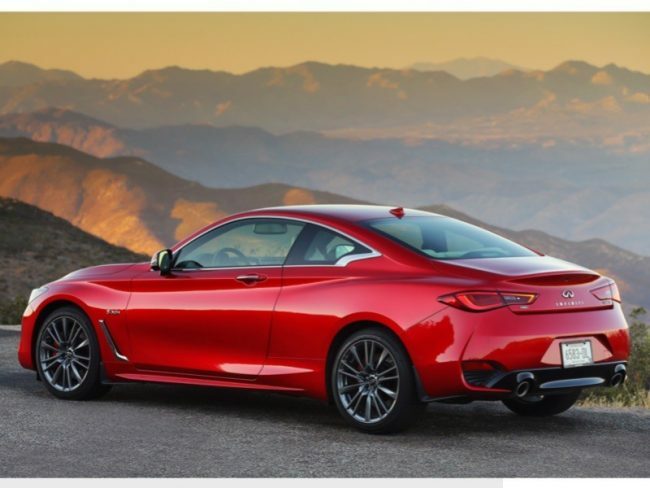 2018 Infiniti Q60 Red Sport 400 Is the 'Coupe' de Grace! 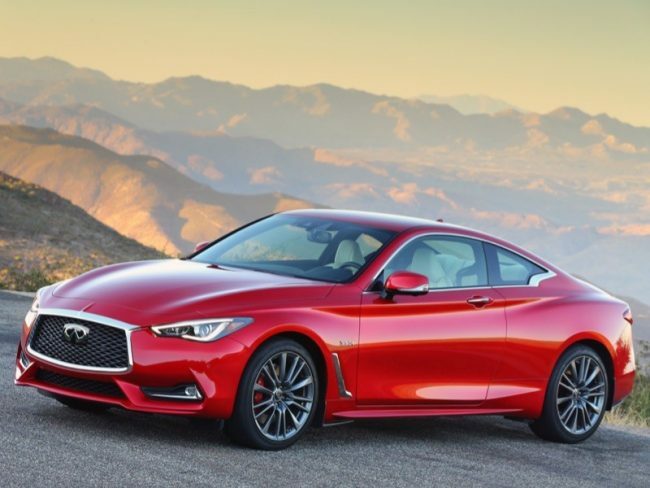 The good news does not stop with the launch of the all-new, third-generation Infiniti coupe as we recently took delivery of what will no doubt be an automotive icon in future years. 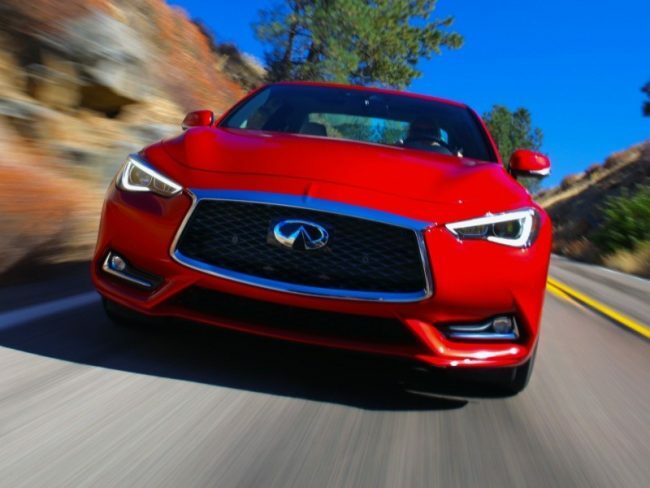 It is known as the Red Sport 400 and despite sounding like it was named for a Nascar race it is the beefiest and sportiest Infiniti coupe to date. 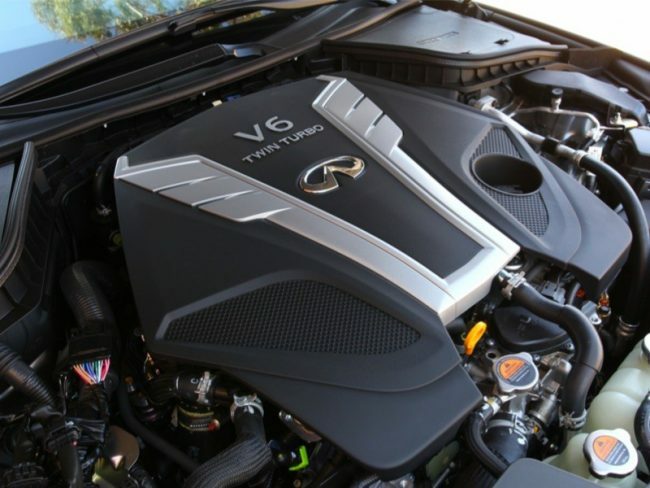 And Infiniti powers it with an engine that is trending all over the motoring world these days – a twin-turbocharged V-6 engine. We have tested this type powerplant before in the likes of the big Genesis sedan and recently in the Kia Stinger GT but under the hood of the new Infiniti Q60 Red Sport 400 this baby really sings. Let me back up a bit as I explain the engine options for the new Q60 models. Infiniti begins with turbocharging a choice of three motors with the base variant being on an inline four-cylinder displacing 2.0-liters. It generates some 208 hp and 258 lb. ft. torque. From there, Infiniti offers two twin-turbo 3.0-liter V-6 engines in 300hp and 400hp. It should come as no surprise the 400hp motor is what arrives under the hood of the Red Sport 400. The base motor is the new VR powerplant, replacing the venerable VQ-series that powered the brand for decades. The new VR is lighter and cleaner and is more fuel-efficient. As for its application in the Red Sport 400, this is one amazing powerplant that makes for some very excited driving. It pulls hard off the line and continues through the powerband. I found it difficult at time to keep the back tires from breaking loose, especially when cold. 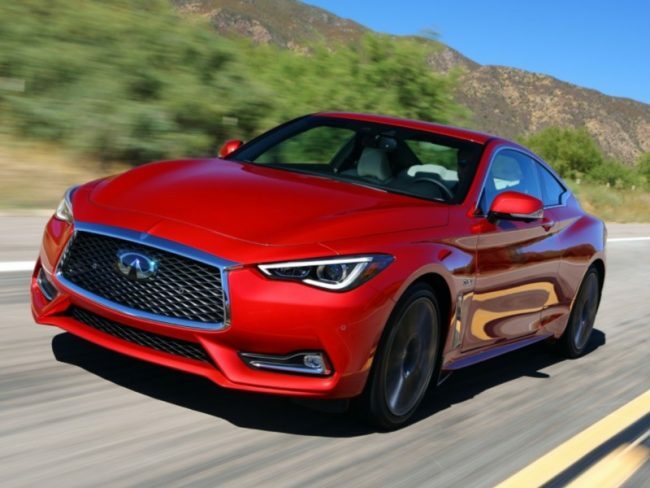 I mentioned the Q60 spinning the rear wheels – yes, it our tester was a rear-wheel drive model and Infiniti offers the coupe in all-wheel drive as well. The engine was mated to a slick seven-speed automatic gearbox and shifting can be done manually via steering wheel paddle shifters. Drivers can modify the behind-the-wheel experience with the drive mode selector that offers Eco, Snow, Standard, Sport, Sport Plus, and Individual settings. 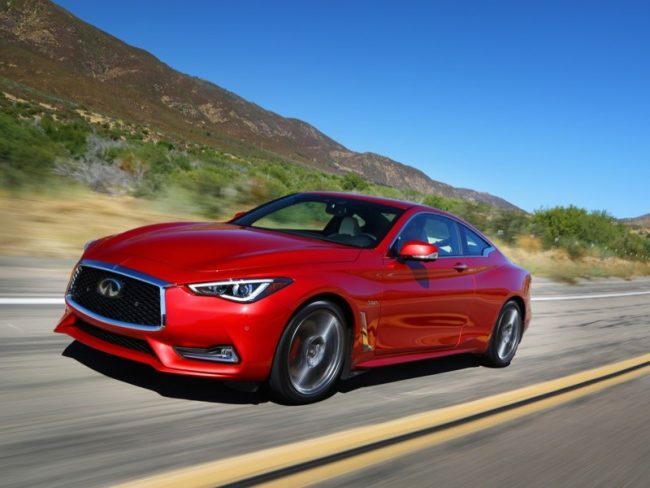 Infiniti brags there are over 300 individual variations a driver can give the Q60 Red Sport 400 via the electronically-controlled throttle, transmission, steering, suspension, and handling systems. For me, I found Standard and Sport to be more than accommodating during my time behind the wheel. That suspension system I mentioned is the new Dynamic Digital Suspension technology that can adapt the ride and handling from luxury smooth to full-on track capable. 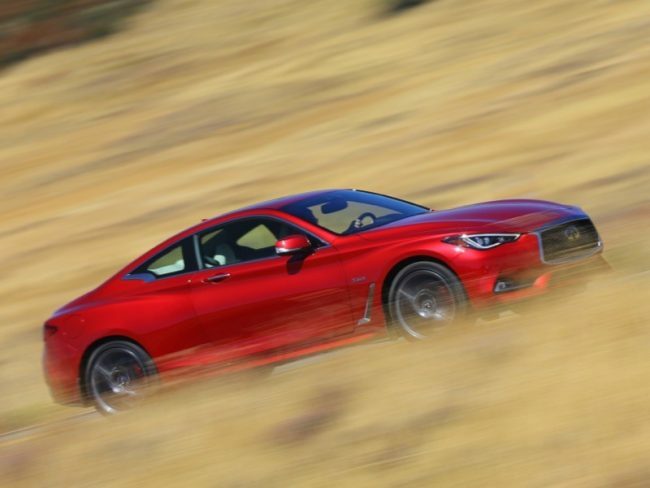 The Q60 Red Sport 400 RWD rides on staggered-width 20-inch aluminum alloy wheels with summer performance tires. The vehicle also arrives with a performance braking package, custom exhaust tips, unique badging and, of course, those 400 ponies. Inside we find as much attention to detail and performance as with the rest of the vehicle. Front seat occupants find themselves planted securely in their sport bucket seats. As this is a sport coupe, the rear seats are not really intended for passengers but they will work for two small adults or just extra storage. The dash features traditional gauges with an electronic driver information panel while the center stack has two electronic touchscreen displays arranged vertically. Nearly all of the vehicle infotainment and climate controls can be accessed here. 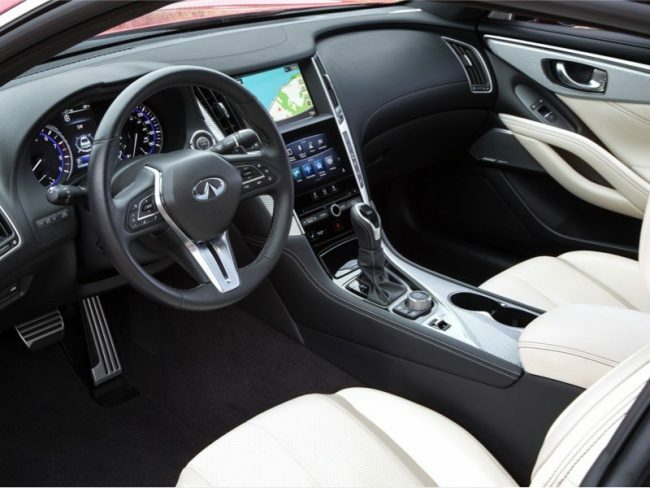 This Q60 also features the Bose Performance Series premium audio system with 13 speakers and Bose Centerpoint surround technology. Our test model arrived with the Sensory, ProAssist, ProActive, and Carbon Fiber packages. These deliver the latest in safety and creature comfort technologies including heated seats and steering wheel, remote engine start, blind sport warning, rear cross traffic alert, backup collision intervention, around view monitor with moving object detection, front and rear sonar system, predictive forward collision warning, forward emergency braking with pedestrian detection, intelligent cruise control, direct adaptive steering, lane departure preventions with active lane control, distance control assist, blind spot intervention, adaptive front lighting system with auto-leveling headlights, high beam assist, eco pedal, and advanced climate control system. The carbon fiber treatments are the rear decklid spoiler, exterior mirror covers, fog lamp finishers, and fender vents. This car is gorgeous, especially in the sunlight. It is bathed in dynamic sunstone red paint that looks a foot deep. It drives like a charm and delivers just as much comfort as it does sport. It is surprisingly quiet and smooth even with the large sport tires. Steering is surprisingly quick although it goes only two turns of the wheel lock-to-lock. The steering response probably took the longest for me to get used to but once acclimated it was very welcome, especially when switching to Sport or Sport Plus modes. We even found adequate room in the trunk for a pre-holiday grocery run. 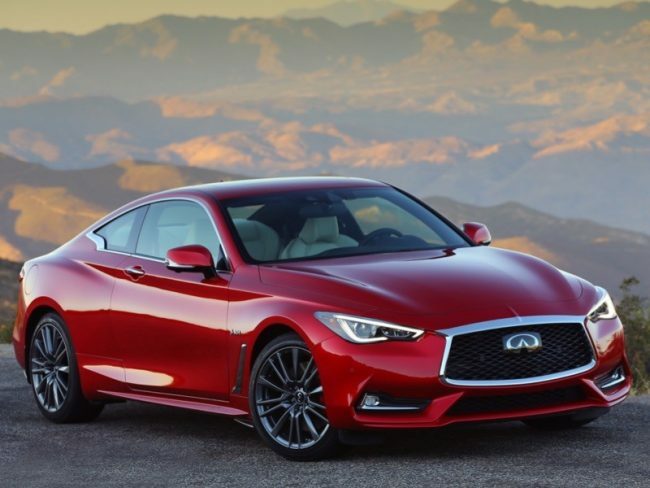 Pricing for the 2018 Infiniti Q60 begins at $38,950 for the base model with turbo I4 engine. Our loaded Red Sport 400 RWD model arrived with a final window sticker of $63,705. Fuel economy is rated at 20 mpg city and 27 mpg highway. This is quite an exceptional car and got jaw-dropping stares everywhere we went. It was a blast to drive but was never punishing or brutal. It works as well for the everyday commute as it does for the night on the town. Infiniti has another winner in this sport coupe as the legacy lives on.